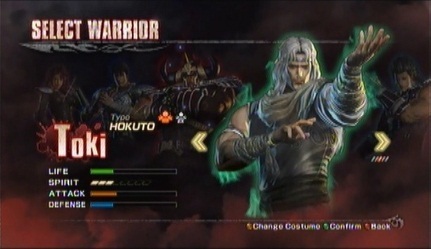 Hokuto Musou is part of Koei's Dynasty Warriors series, and was released in 2010 for the Playstation 3 and Xbox 360. 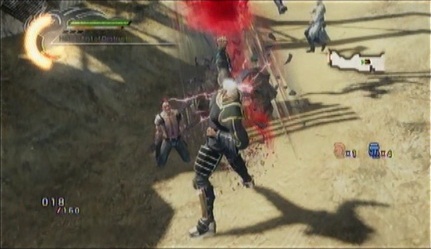 The game is a beat 'em up where you can play as one of several characters, and fight lots of foes on large maps. 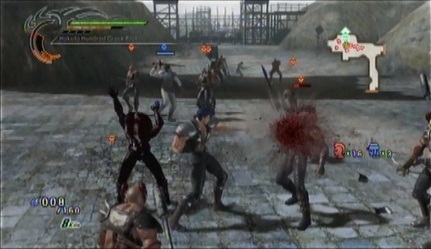 The game offers a standard story mode which loosely follows the events of the manga, along with a dream mode which offers some "what if?" stories and has more characters to play as than in the standard story mode. 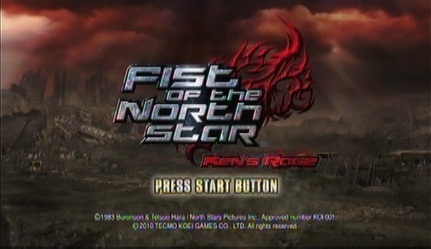 The game was released outside Japan as Fist of the North Star: Ken's Rage, and had several changes from the original Japanese release (see below). Whilst reviews in Japan were fairly positive, this was not the case in American and Europe, with reviewers criticizing the graphics and repetitive gameplay. Legend mode is the game's standard story mode. You will only be able to pick Kenshiro at first, but can unlock Rei, Mamiya, Toki and Raoh along the way, who all have separate levels to complete. Each level consists of you fighting through various enemies, such as the Fang clan or troops of Raoh, Yuda or Souther, and completing mini-missions such as defending villagers or destroying certain objects. Completing these missions will open up more of a level, allowing you to progress. 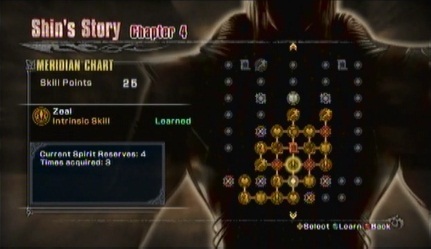 Each character has many different moves, most of which have to be unlocked. By completing levels or finding special items in each level, you can collect skill points, which you can then spend on making a character stronger, giving them new moves, or more health etc. Characters all have several different special techniques, which can be performed by filling the special technique gauge up to the required level. To fill the gauge, simply keep defeating enemies or find special items in a level. It is also possible to fill another gauge which can make your character stronger for a brief amount of time. 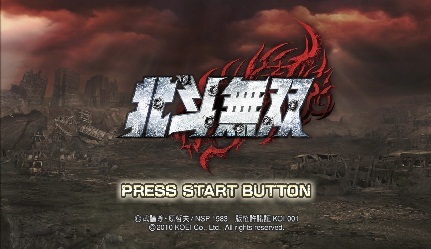 Illusionary Match mode is a special story option which lets you pick a character (Kenshiro, Shin, Rei, Mamiya, Jagi, Toki, Souther and Raoh) and play through several levels set in large maps, with all new storylines. The objective in these levels is to take control of certain spots on the map, by clearing out the required amount of enemies. As the level goes on, extra objectives will also crop up, such as defending another character from enemies. The Illusionary Match mode also has a 2 player option via split screen (there is no online play option). Challenge mode lets you have a try at some extra levels, which have specific requirements to beat and can be some of the hardest stages in the game. Extra stages for this mode are available via DLC. The game did well in Japan, getting good reviews and selling over half a million copies shortly after it was released. It shot straight to the top of the charts and was one of the most popular Playstation 3 games of the year. *A new prologue level was added at the start of the story mode. 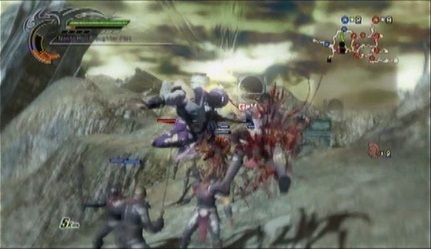 *The difficulty balance was changed, with some enemies being slightly more aggressive, but others toned down. *The game can be much more goerier than the Japanese version, but there is an option to tone it down. *New idle animations were added, such as Toki sitting down and meditating. *It is now possible to smash through crates using Kokuoh or the bike. 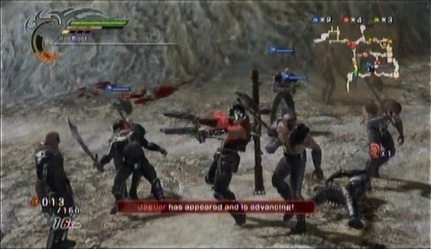 The Ken's Rage version was eventually released in Japan, under the name of Hokuto Musou: International. Ken's Rage did not fare as well critically, such as Edge giving it a 5 out of 10 and IGN giving it a 5.0 out of 10, stating it was nothing special, had a confusing story mode (the cut-scenes really don't do a good job at explaining what is going on), repetitive gameplay and unpolished graphics. Several downloadable content packs were released shortly after the game came out. 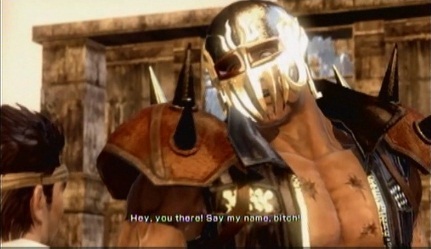 A code to download Kenshiro's original manga outfit was included in new copies of the game when it was first released, and several retailers offered the Heart or Outlaw packs as pre-order bonuses (Outlaw is a generic thug who has a lot of silly moves). Heart and Outlaw do not have story modes, but can be used in the dream and challenge modes. Adds Kenshiro's original manga outfit. Adds Jagi's original manga outfit & 2 extra challenge mode missions. Adds Toki's original manga outfit & 2 extra challenge mode missions. Adds Shin & Souther's original manga outfits & 2 extra challenge mode missions. Adds Heart as a playable character & 2 extra challenge mode missions. Adds Outlaw as a playable character & 1 extra challenge mode mission. Adds Rei, Mamiya and Raoh's original manga outfits. Complete dream mode with Kenshiro, and a sound test will be available in the gallery mode. Complete Illusionary Match mode with Kenshiro. Complete Illusionary Match mode with Rei. Complete Illusionary Match mode with Toki. Complete Illusionary Match mode with Raoh. 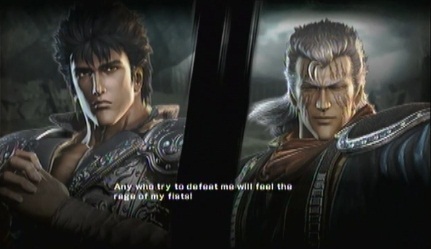 Complete the second level of Kenshiro's legend mode. Complete the sixth level of Kenshiro's legend mode. Complete legend mode with Kenshiro, Rei, Toki and Mamiya. Complete legend mode with Kenshiro. 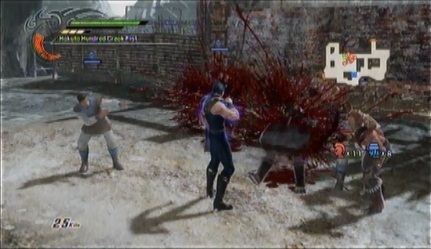 Complete the second level of Kenshiro's illusionary match mode. Complete illusionary match mode with Shin. Complete the fourth level of Kenshiro's illusionary match mode. Complete illusionary match mode with Kenshiro, Shin, Mamiya, Rei, Jagi, Souther and Toki.